There is something odd about this scan of a patient's lung. Have you spotted it yet? How about the dancing gorilla on the right? It is not an everyday finding for radiologists, who are skilled at searching scans for tiny anomalies with potentially life-threatening consequences. But in one study, more than three-quarters of specialist tumour spotters were caught out by the greatest anomaly of their career. The out-of-place image was the brainchild of Dr Trafton Drew, a psychologist at Harvard medical school. He spent hours watching radiologists flicking through CT chest images and marvelled at their ability to detect tiny indicators of lung cancer. "When I first saw radiologists searching through these images, they go through so fast and they detect these things that to me looked completely invisible and I just wondered how in the world are they doing this?" He was inspired by a classic experiment from the 1990s, in which observers of a basketball practice failed to see a man in a gorilla suit walk across the screen. Dr Drew believed that radiologists, "the best searchers in the world", were good at detecting cancers but wondered what else they might be missing. When we focus our attention on a narrow task we tend to miss other things and this effect, termed inattentional blindness, is exactly what the basketball observers were demonstrating. It turns out that there's a big difference between looking at something and perceiving it. He asked radiologists to inspect CT chest scans for abnormalities called nodules, which could indicate lung cancer. Unknown to them, he had boldly superimposed a matchbox-sized image of a gorilla into some of the scans. When asked afterwards if they had seen a gorilla, more than 80% of radiologists and 100% of unskilled observers, said they had seen nothing - this despite the fact that the eye-tracking monitor showed that half the radiologists who did not see the gorilla had actually looked right at it for about half a second. "Part of the reason that radiologists are so good at what they do is that they are very good at narrowly focusing their attention on these lung nodules. And the cost of that is that they're subject to missing other things, even really obvious large things like a gorilla." Prof Daniel Simons, author of the original invisible gorilla study, explained that this effect is not unique to radiologists and reflects the way our attention system works. "We're aware of only a small subset of our visual world at any time. We focus attention on those aspects of the world that we want to see. "By focusing attention, we can filter out distractions. But in limiting our attention to just those aspects of our world we are trying to see, we tend not to notice unexpected objects or events." It sounds dangerous that these expert radiologists might fail to spot something as obvious as a gorilla in your lung scan. 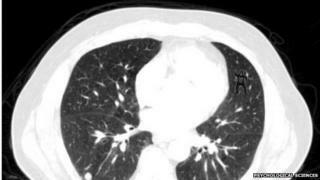 But the radiologists were asked to search for lung cancer nodules alone and nothing else. Dr Drew thinks that if they had been asked to say more generally if there was anything wrong with the scans they would have been much more likely to find the gorilla. "It shouldn't terrify you because they're looking for cancer and not gorillas," he said. "Because attention is a finite quantity you have to make a decision going into the search about what's most important to you." Dr Andoni Toms is consultant radiologist at Norfolk & Norwich University Hospital and a fellow of the Royal College of Radiologists. "When you first start as a trainee, it's extremely frustrating because you look at a chest CT scan and you go through slice by slice looking for abnormalities. "Something happens several years after you start, and several thousand studies after you start; that search process becomes automated so you don't have to concentrate. "If you look at a senior consultant their eyes go to the abnormality within 200ms." "How do you know when a radiologist has been trained? They sit an exam. But you could argue what you should do is get them to sit in front of an eye-tracking machine and if they have got a consultant pattern of movements they have seen enough cases. That's the future, but we're a long way off." And for the radiologists in this experiment the gorilla is very different from the nodules they were told to search for. Dr Drew suggests that more of them might have detected an albino gorilla or, counter-intuitively, a smaller gorilla, closer to the size of the target nodules. And it is not just gorillas. Drivers looking for cars at a junction can be blinded to cyclists, and baggage screeners at airports find it easier to focus on looking just for explosives or knives rather than trying to spot both. Prof Nillie Lavie, an expert in attention at University College London, agrees. "On one hand it's worrying but on the other hand there are some mitigating circumstances. They were trained to look for particular features - size and colour. So it does not reflect at all on the radiologists' ability to report nodules. It reflects on their ability to report something unexpected. And that is something that could be trained." Prioritising what we pay attention to has benefits. It allows us to ignore distractions and focus on the task at hand. But it's important to be aware of our limitations, says Prof Simons. "I don't think we should be worried about these limits of attention, but we should be aware of them. We assume we will notice. And it's that mistaken belief that is dangerous. If you assume you will notice the gorilla, you won't take steps to make sure that you will." "By knowing about these limits, we potentially could take steps to avoid them. For example, another radiologist could inspect the same images but without looking for a specific problem. If they don't have a really narrow goal, they might be more likely to spot unexpected problems."